“We’ve lost at least several hundred acres of avocados, probably more,” the California Avocado Commission told agriculture news site AgNet West. About 90% of US avocados are grown in California, and the industry is worth millions to the economy. About 5,700 firefighters have been battling the fires, officials say. One death has been confirmed – that of a 70-year-old woman found in her car on Wednesday. Three firefighters have been injured and about 500 buildings destroyed. There are now fears the fires will have serious implications for California’s vast agricultural industry. Last season’s avocado harvest produced a crop worth more than $400m (£300m), according to the California Avocado Commission. Much of this was grown on family-owned farms in the south of the state. 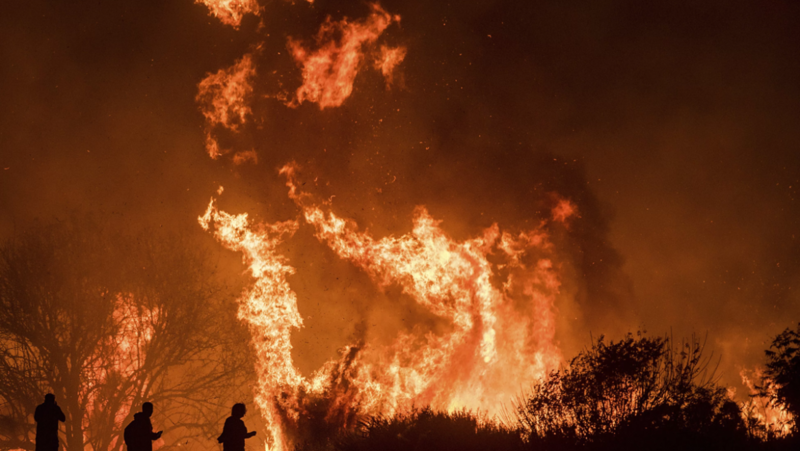 Ventura County, which is California’s largest growing region for avocados, has seen the worst of the fires with 180 square miles (466 sq km) consumed, according to officials. Food safety regulations mean the crop cannot be sold once it falls from the tree. The fires mean the upcoming harvest, which usually takes place in February or March, is likely to be smaller than usual. However experts say it too soon to assess the full extent of the damage. Elsewhere, US President Donald Trump has declared a state of emergency, which will free up funding to “help alleviate the hardship and suffering that the emergency may inflict on the local population”. 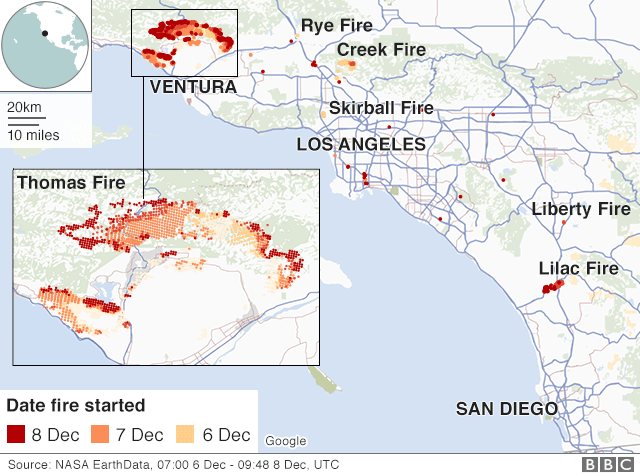 Nearly 200,000 residents have been evacuated from their homes as firefighters battle the wildfires on several fronts. 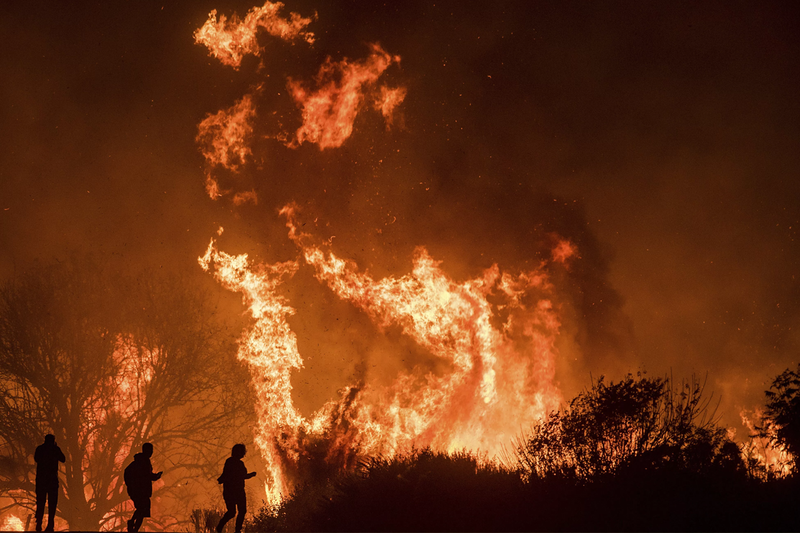 Governor Jerry Brown declared a state of emergency in San Diego on Thursday after a new blaze spread from 10 acres to 4,100 acres in just a few hours. Authorities have issued a purple alert – the highest level warning – amid what they have called “extremely critical fire weather”.